THANKSGIVING RECIPE (APPETIZER): WATERMELON HAM WRAPS - What About Watermelon? As promised, here’s the first of five Thanksgiving-themed watermelon recipes I’ll be featuring on the blog this month. This is the one I will be making for my dinner with my family later this month. It’s easy to make and it looks pretty tasty too. The picture above isn’t exactly what this recipe will look like, but it’s close. Spread cream cheese on tortilla, covering to edges. Place ham across center of tortilla; top with leaf lettuce, making sure edges to be rolled are not covered. Place watermelon spear on lettuce just off center. Roll tortilla over watermelon spear; continue rolling, tucking in ham and lettuce. 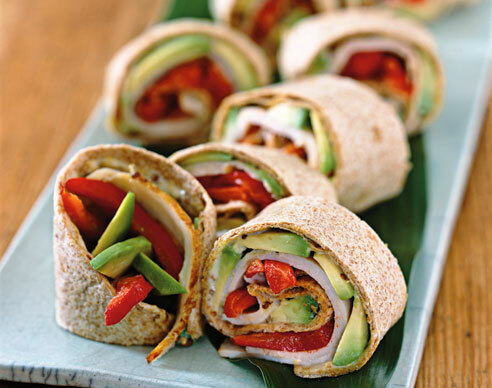 Cream cheese will help tortilla stay rolled. Slice wrap into half inch to three-quarters of an inch pieces. Fasten pieces with wooden pick if needed.